You may notice that all of the add-on products are included in evaluation versions of both COMSOL Multiphysics and COMSOL Server™. For the latest version of the software, the Application Libraries have been expanded to include nearly 60 example apps that you can run, inspect, modify, or copy contents from into your own apps. Some of these apps function as ready-to-use simulations in their own right, whereas others are for demonstrating certain functionality of the Application Builder, or for educational purposes in academia. Let’s take a look at a few of the new example applications. One of the example apps for microwave engineering is the Single Slot-Coupled Microstrip Patch Antenna Array Synthesizer. This app analyzes an antenna array that is fabricated on a multilayered low-temperature cofired ceramic (LTCC) substrate. This app has potential uses for phased antenna array prototypes for 5G mobile networks. The Microstrip Patch Antenna Array Synthesizer simulation app. The Absorptive Muffler Designer is used for studying and designing a simple resonant muffler with a porous lining. These devices have acoustical applications in the automotive and HVAC industries. This application is an example of a “dynamic specification sheet” for a given muffler model. A sales engineer can bring this type of simulation app to customers and show them the performance of a custom muffler designed specifically for them. A muffler may, for example, be designed to be placed in a vehicle with spatial constraints. In this case, the performance can be readily visualized and different options can be investigated together with the customer. The Absorptive Muffler Designer app. For structural analysis, the Beam Section Calculator app computes steel beam section properties for a broad range of American and European standard beams. The app also calculates a detailed stress distribution over the cross section of the beam given a set of forces and moments acting on it. The Beam Section Calculator app’s user interface. 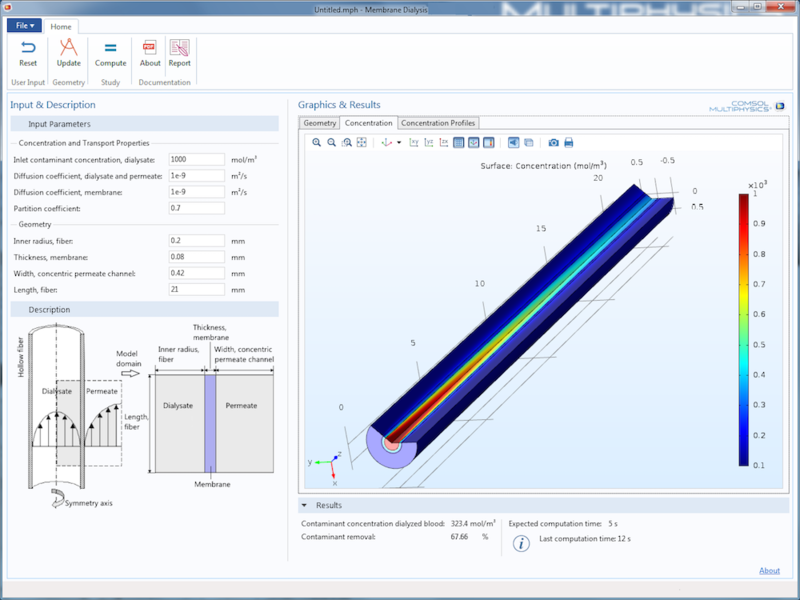 For heat transfer analysis, you can use the Cooling Finned Pipe Designer to customize a long cylindrical pipe with predefined inner and outer fins or grooves to observe and evaluate their cooling effects. Finned pipes are used for coolers, heaters, and heat exchangers to increase thermal performance. The Cooling Finned Pipe Designer example app. 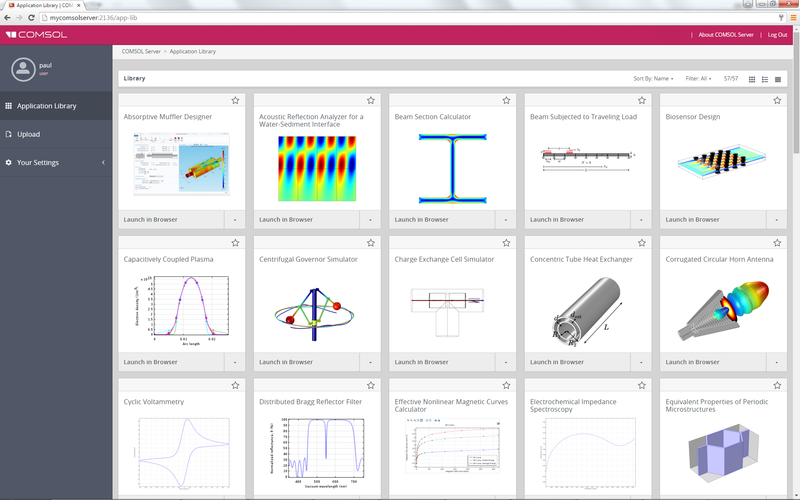 The example apps are visible in the Application Library page of the COMSOL Server™ web interface. During the installation process, the installer lets you choose if you wish to install the example apps or not. For a production installation, you may only want to show your proprietary apps. 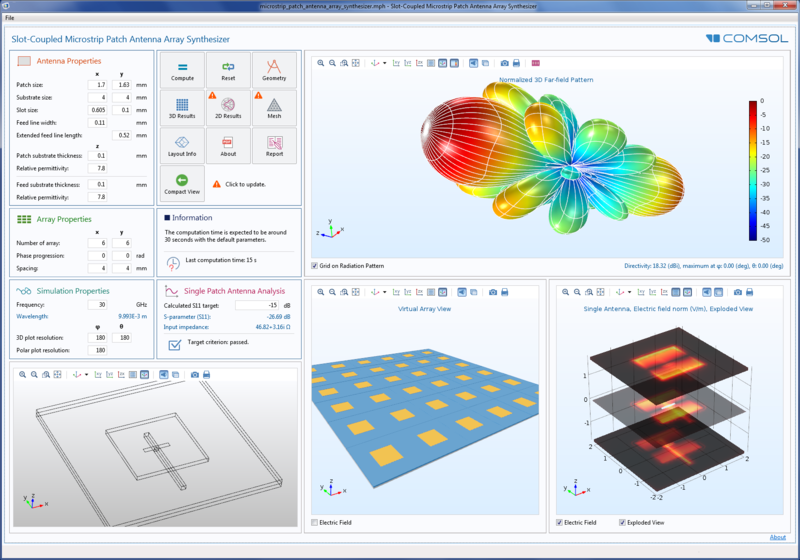 The Application Library view in the COMSOL Server™ web interface. On the COMSOL Server™ Application Library page, each app has a card with two menu options: Launch in Browser and Launch in COMSOL Client. The Launch in Browser option will start the app on the server and then show its user interface in a separate browser tab. This option has been available since the first release of COMSOL Server™. The Membrane Dialysis app, run in a web browser. The Launch in COMSOL Client option is new with version 5.2 and lets you open the app in a separate window with the look and feel of the COMSOL Desktop. In other words, even if you are browsing to the COMSOL Server™ interface from a web browser, you can now run the app in the COMSOL Client. 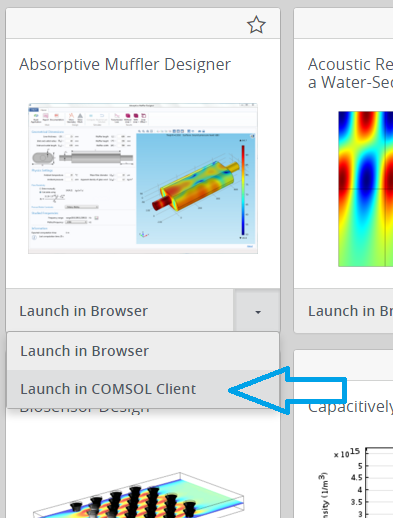 If you didn’t already install the COMSOL Client, it will prompt you to download and install it. The COMSOL Client for Windows® is available as a free download. 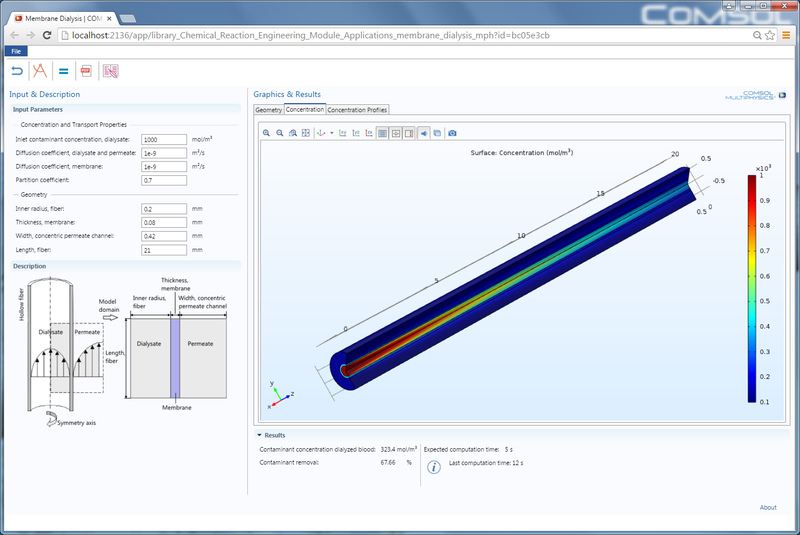 The new option for launching an app in the COMSOL Client for Windows®. 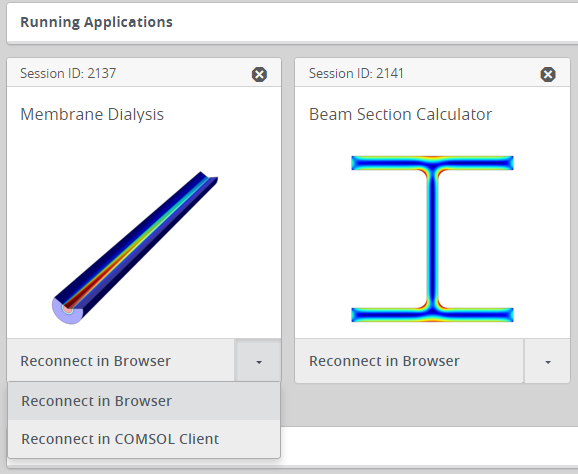 The Membrane Dialysis app, run in the COMSOL Client for Windows®. If, for some reason, you lost connection to an app, you can now reconnect to it on the fly. This could happen if you lose your network connection to the COMSOL Server™ installation, for example, or if you just want to change the computer from which you log into COMSOL Server™. You can, for example, log in and start running an app at work, close the user interface (the client), go home, and log into COMSOL Server™ again and continue with your app session where you left off. The new options for reconnecting to an already running application. You may ask: When I run an app with COMSOL Server™, where are all of the computations taking place? The answer is that all of the heavy computations take place server-side, with only the user interface components running in the web browser or the COMSOL Client. Whenever you change an input parameter and click on a button that requires recomputing or remeshing, the heavy work is done on the computer where the COMSOL Server™ installation resides. This could be locally on your computer, but more commonly, somewhere else on your network or possibly in a remote location in the world. It all depends on where you choose to install COMSOL Server™ or if you decide to connect to an already existing COMSOL Server™ installation. For a COMSOL Server™ installation with many users, you can choose to run secondary servers. This means that the workload of running the applications can be distributed across several physical computers. This load balancing is taken care of automatically by the primary COMSOL Server™ installation. The users running the applications still only need to log into the primary server. The only “computation” taking place client-side, in a web browser or the COMSOL Client, is the graphics rendering. All graphics rendering is performed locally in order to utilize hardware acceleration, if available. Even web browsers nowadays support sophisticated interactive 3D graphics out of the box, using a standard called WebGL™. 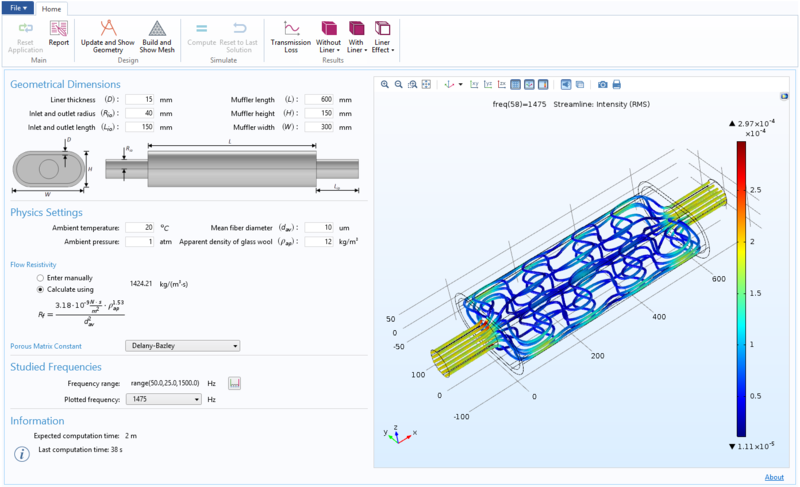 Apps are much faster to launch in version 5.2 thanks to a new way of allowing COMSOL Server™ to preload apps in the background. There are two different methods for preloading. The first method is to select a set of important apps that should always be preloaded. The second method is to set the number of recently run apps that should be preloaded. These two methods can also be combined. Launching preloaded apps can be up to five times faster than in previous versions. The administrator preferences for preloading apps for faster launch times. The administrator view of prelaunched application processes. COMSOL Server™ can now be configured to be a “one-app server”. This is very useful if you plan to use a COMSOL Server™ installation for the purpose of running a single dedicated app. As an administrator, you can configure which app to run from the Administrator Preferences page. The new setting for launching an application directly upon login. When configured in this way, a nonadministrative user will never see the Application Library page. Instead, the dedicated app will be launched directly upon login. The app that is selected to run on login will always be preloaded to make sure that it starts as soon as possible. How Does a COMSOL Server™ License Work? How does a COMSOL Server™ license work in comparison to a traditional COMSOL Multiphysics license? With regards to the license management of a COMSOL Server™ license, a FlexNet® license manager is used just like a traditional floating network license. 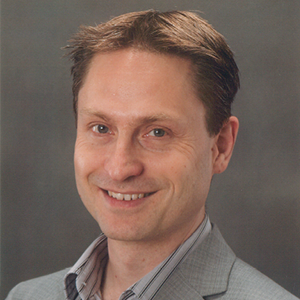 This license manager can run locally on your computer or anywhere else in your organization. The COMSOL Server™ license then lets you use standard web technology to connect to your COMSOL Server™ installation. COMSOL Server™ uses the same computational engine that is used in COMSOL Multiphysics. In addition to the computational engine, a COMSOL Server™ installation also includes a web server software component. For your colleagues to connect to your COMSOL Server™ installation, you just send them its web address, which will bring them to the login page and then the Application Library page. You can even give them direct access to a dedicated app by sending them a link, such as http://my-company.example.com/app/absorptive_muffler. This will bring them to the app directly, rather than to the Application Library page. What about a case where you only want a local installation and you want to use COMSOL Server™ on a computer that may not even be connected to a network? This case is particularly simple. The COMSOL Server™ installation, including its web server component, will run on your local computer. 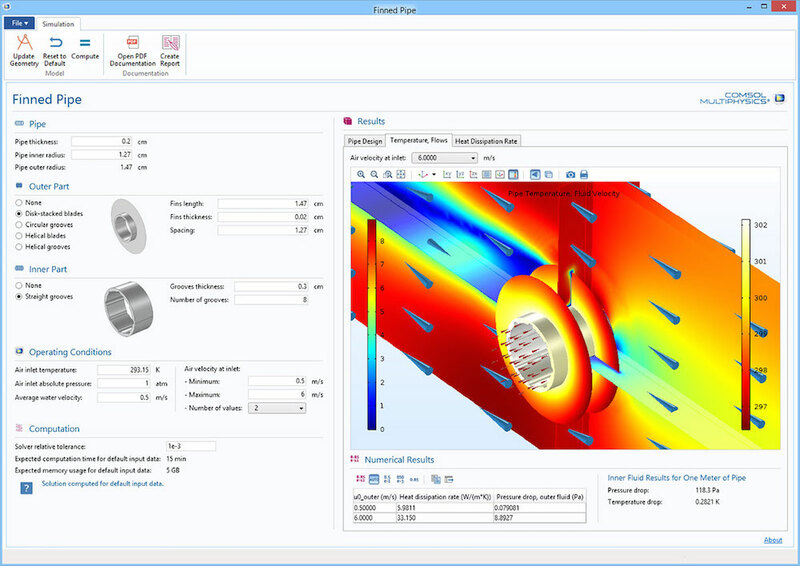 You connect to it from a browser or COMSOL Client that is also running on the same computer. In this case, you use a local web address, such as http://localhost:2036/app/absorptive_muffler, where 2036 is the so-called port number. With version 5.2, you are able to access the capabilities of COMSOL Server™ anywhere, even within the boundaries of a single computer! 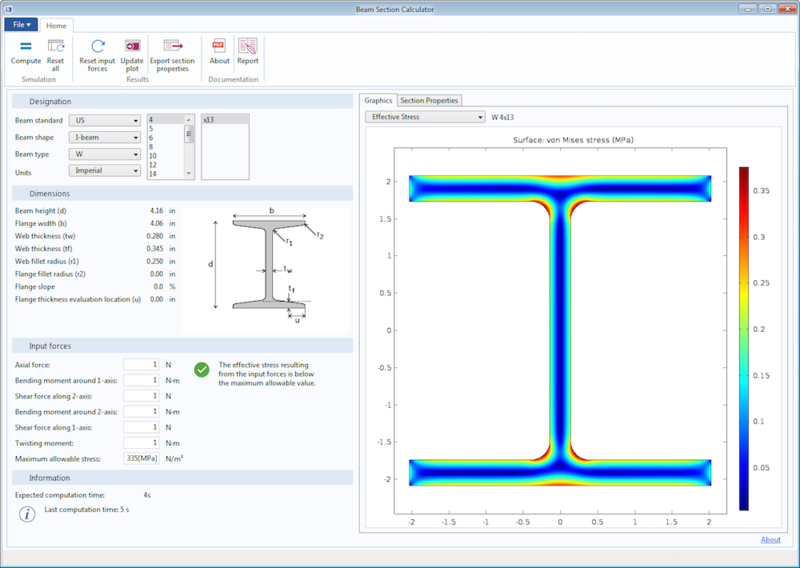 Read more about the updates included with version 5.2 of COMSOL Multiphysics and COMSOL Server™.